Before I tell you about another fun Etsy adventure a friend and I went on this week, I would like to thank everyone who commented on my last post about the fires that are ongoing in Colorado, and for your prayers. 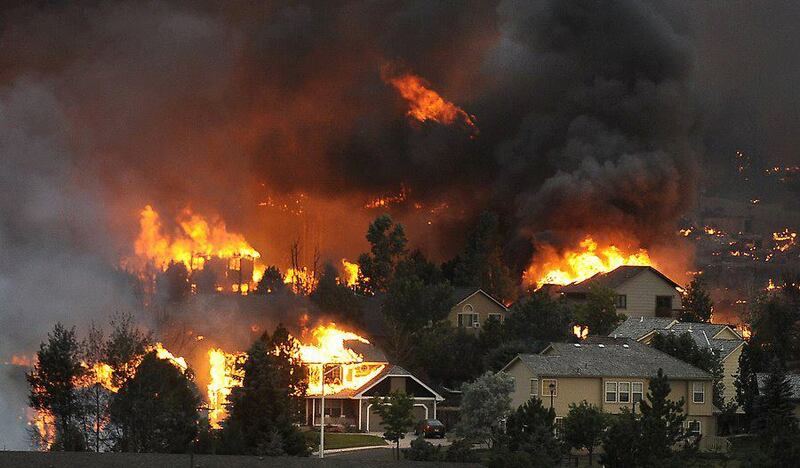 My family is safe, but my heart goes out to all the people who have lost their homes and businesses. Thankfully, up to now, loss of life from the varied fires has been small, but extreme danger remains. I hope all the Western states that need a good, long, soaking rain get it very soon so that the fires will be fully extinguished and the danger of future fires will finally be over. Now on to "Hands On Dumbo"! The headquarters of the popular online e-commerce handmade and vintage craft store called Etsy is located in Brooklyn, NY, in a friendly little neighborhood called DUMBO, which is an acronym for Down Under the Manhattan Bridge Overpass. They, along with the Dumbo Improvement District, hosted a "Hands on DUMBO" event to allow participants to explore this unique Brooklyn neighborhood and take part in craft projects hosted by seven local businesses. The Hands-On DUMBO meeting began at the Archway area of the Manhattan Bridge, with music being played by DJ Colleen Crumbcake, photos at a photo booth, and a pinprick card project led by Etsy staff. A map of the DUMBO neighborhood was also handed out listing the locations of all the evening’s crafting festivities. The Archway is actually part of the Manhattan Bridge overpass and has been turned into a unique meeting place! The 7,000 square foot space has seating, lighting, electricity, and free wifi, all provided by the DUMBO Improvement District year-round for use by the community. It is also available for use for special events. The entire Hands On Dumbo event was free, with pre-registration. The main office of Etsy on 55 Washington Street also hosts a free open monthly craft night called "Etsy Labs," that offers a wide assortment of different crafts projects and tutorials. You can read a prior post I wrote about visiting the Etsy Lab for a felting workshop on this link. At Neighborhoodies, located at 26 Jay Street, we made hand-sewn patches, just like they produce for their custom sweatshirts and tees for men, women, and children, which they sell individually through internet orders, along with bulk orders. They showed us the process of ironing on decals and then surrounding the design with stitches. We loved their space on the ground floor of an old warehouse, and they graciously allowed us to walk around to see more. 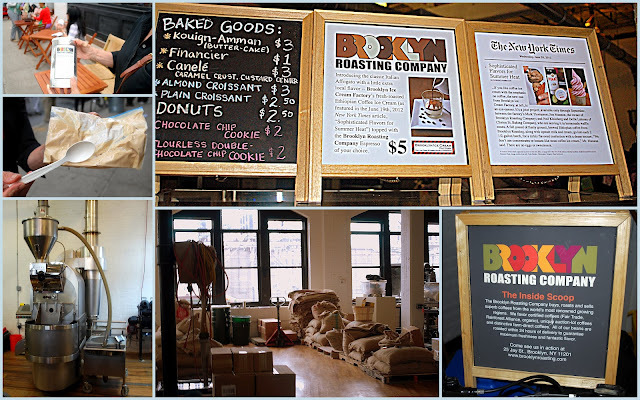 At the Brooklyn Roasting Company located at 25 Jay Street, we learned how to turn a coffee can into a DIY ice cream maker, and made a pouch of coffee flavored ice cream that we enjoyed on the spot. I think I will have to return to their cafe someday soon to enjoy some of their Fair Trade, Rainforest Alliance, and Organic certified and sustainable coffees, and have one of their Italian Affogatos, which is ice cream smothered with strong brewed coffee. They also sell their coffee beans online. In the retro and nostalgic candy store Dewey’s Candy, located at 141 Front Street, we had fun browsing the supplies of all kinds of hard to find candy we remembered from our youth. There we had fun making buttons with retro candy wrappers with Michele Boudreaux of the Etsy shop "Lollypops by Mihow." 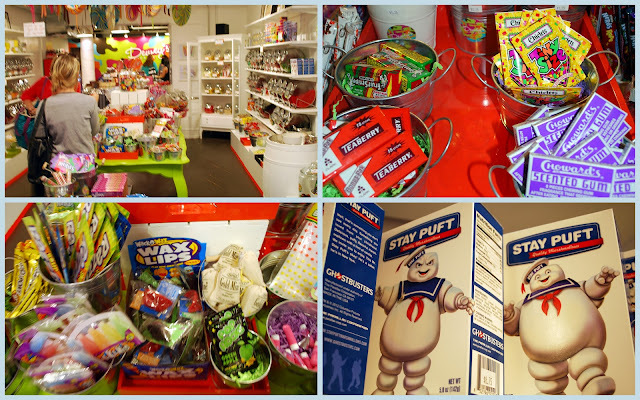 Dewey'shost's parties and events and can make up customized gift baskets of all your favorite candies! It is easy to see why they are called the "sweetest shop in DUMBO!" 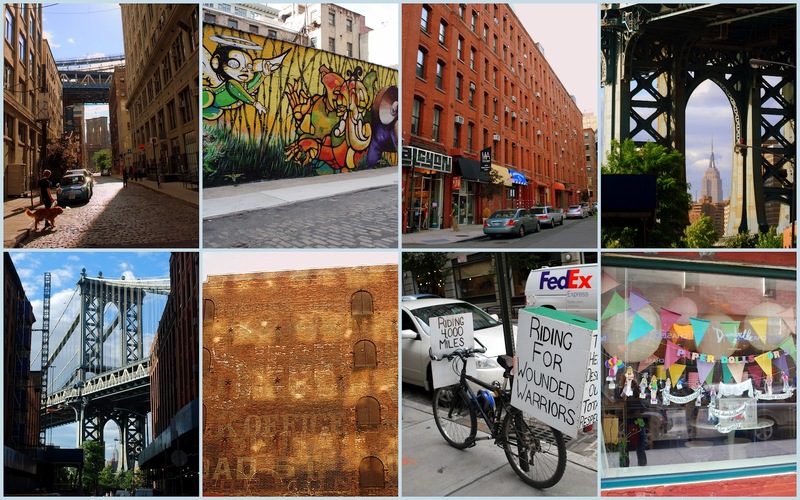 My friend and I always find it interesting to walk around the vintage cobblestone streets of the DUMBO neighborhood. It is a mix of old industrial factories, some of which date back to the 1800's, that are now being converted into a mix of new artisan businesses, condominiums, artists lofts and stores. The Brooklyn Museum recently sent me an e-mail that stated that Brooklyn, New York is now home to more artists than anywhere else in the United States, making it one of the world's capital of creativity, and that is certainly evident in DUMBO. 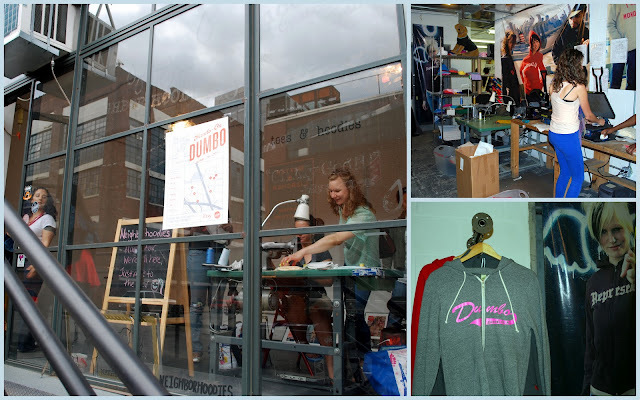 You can learn more about the DUMBO community and its businesses and culture on this link. The approaching evening was pleasantly mild in temperature, so we decided to take a walk over to the waterfront and walk along the Brooklyn Bridge Park path. Large bushes of pink, purple and blue hydrangeas were blooming so beautifully outside the chic River Cafe restaurant. From our vantage point in the park, we had another wonderful view of the entire span of the Manhattan Bridge -- one of three bridges that connects Brooklyn to Manhattan over the East River. In the other direction, we could see the Brooklyn Bridge, and we lingered awhile on the path to watch the sun begin to set behind the buildings of lower Manhattan. Standing on the edge of the water I could actually hear the hum and vibration of the city as the sun slowly dipped down below the horizon. New York is so full of life and excitement -- I think you can see why I love living here so much. Thank you, Etsy, and all the shops that participated in Hand On DUMBO, for a wonderful evening! Photo source: Colorado Springs Gazette. If you are a regular reader of my blog you know my children live in the beautiful state of Colorado, in the Denver area. Many areas of Colorado have been besieged by wildfires of epic proportions this past month, most caused by lightning hitting extremely dry trees and brush. 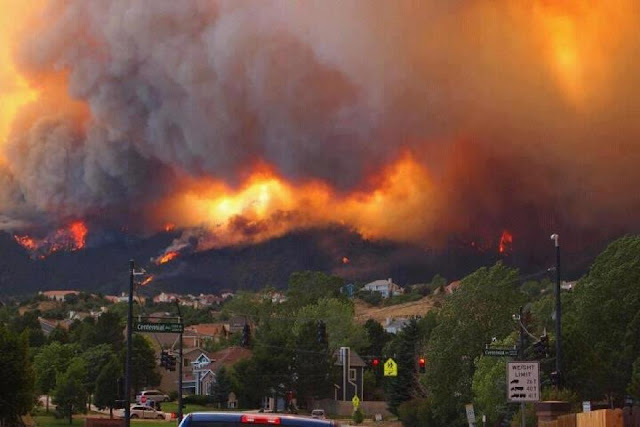 One of the latest fires of concern is in the foothill areas of Colorado Springs, the second largest city of Colorado, about an hour driving distance from Denver. As you can see by the photo above, this raging fire is extensive, and out of control! Tens of thousands of residents have had to flee their homes, and many neighborhoods are being destroyed by the flames. The United States Air Force Academy is located in Colorado Springs, and as you can see by the photo above of the Air Force Chapel surrounded by smoke wafting across the canyon, it may also be in danger if the fires are not quickly put under control. If you watch the heartbreaking CBS video above (it begins with a brief commercial) you will see that one fleeing resident of Boulder County took only one possession--the American Flag that was his son's. His son lost his life in the military in Iraq. There are more than eight large wildfires burning across the state, the latest in Boulder County, north of Denver, which was also caused by a lightning strike. 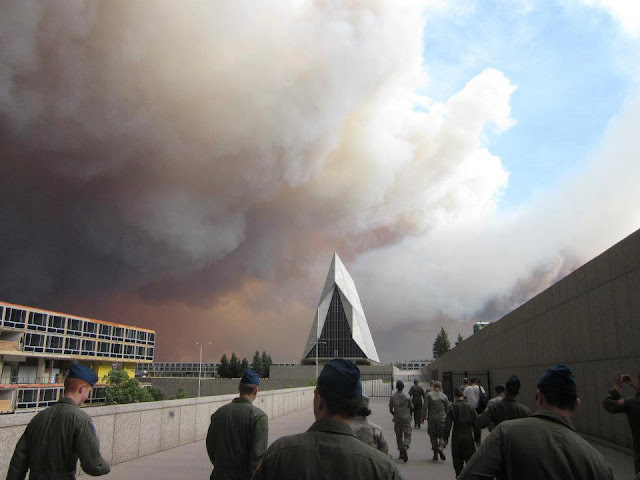 Record high temperatures above 100 degrees and extreme drought and high winds have been fueling all the fires and smoke, exhausting the thousands of firefighters on duty, and hindering the more than 100 airplanes and helicopters that are trying to dump water and fire retardant on the flames. My thoughts and prayers go out to the people and state of Colorado, for their safety, that a good long soaking rain will help quench these fires and prevent new ones I am worried about my children and grandchildren, that they also may face the danger of fires in their area. Please keep them all in your prayers! As a participant in BlogHer and P and G Life Well Lived editorial blog panel, I was asked to name my favorite resources for inspiration on style, fashion, beauty, and living life well. I will admit that I've never been a designer clothing fashionista. I attended parochial school from grades one through twelve, where I was always required to wear a uniform. While I attended nursing school and college I lived on a tight budget with little money to spend on clothes, and when I began my career as a Registered Nurse I wore either a nurse's uniform or scrubs. Since wearing a uniform of some sort was the "de rigueur" for most of my life, amassing an ultra fashionable wardrobe was never a priority. My closets are filled with the traditional basics and an occasional dressy outfit if I need one for a special occasion. Most of the time I choose my seasonal wardrobe essentials from Lands' End and LL Bean catalogs, or I shop in J Crew and The Gap for comfortable sweaters, turtlenecks, tee shirts, and jeans. I like a classic look and these stores suit me well. Lately, I have to say that Pinterest has become a major obsession of mine and a tremendous resource for links to blogs and magazine publications full of inspiring ideas. The old adage of "a picture is worth a thousand words" is certainly true on Pinterest, and as I scroll through the "Everything" category, or look at the pins of the many I follow, I happily fill up my boards with more pins. There I have a board devoted to Beauty, where I pin makeup and beauty tips, hairstyles I like, and nail care and nail polish colors I'd like to remember. On my Fashion board, I pin clothing styles, bags, shoes, and specific items I'd like to buy. I still prefer a casual, comfortable style of clothing which is reflected in my pins, but I also love to "virtually shop" for outfits I'd love to wear if I were a few sizes smaller. This is where my Healthy Living board becomes important, as on this board I pin diet, exercise, and all around health tips. Perhaps these sources will be the motivation I need to shed some pounds and get back to my ideal weight? I am also a "foodie," so of course I pin lots of delicious recipes on my many food pinboards. Recently I was surprised and excited to learn that The Huffington Post's "Kitchen Daily" named me as one of their 'Pinterest Users You Should Follow" for the category of Candy! Woohoo! I've always had a sweet tooth! As far as living life well, I look at all my pin boards as a springboard towards leading me to do just that. I was always one who liked to clip ideas out of magazines and newspapers for future reference, and now I can do this easily on Pinterest without cluttering up my desk. My Get Organized board has helped me de-clutter and organize my house, and my Tips and Tricks board is full of interesting information to reference how to do household tasks more easily. When I take a few minutes out of the day to pin my interests on boards such as Books, Gardening, Photography, Inspiring Words, Social Media and Blog Ideas and Do It Yourself boards, I feel inspired by all these new ideas. If I want to take a mini vacation, I pin photographs that remind me of Places I've Visited and Dream Destinations. For me, browsing through Pinterest is a wonderful way to de-stress. 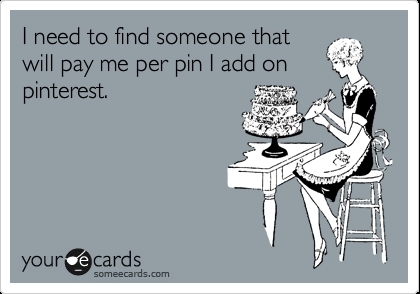 I unabashedly love Pinterest, and I feel it is one of the most enjoyable resources on the web! I love the fresh fruits of summer, and on a recent trip to a popular warehouse store, I bought a large container of apricots and a couple of large containers of blueberries. Combined with a bumper crop of tiny new strawberries that I picked from my backyard bushes I decided that it would be nice to use them in a fruit tart. 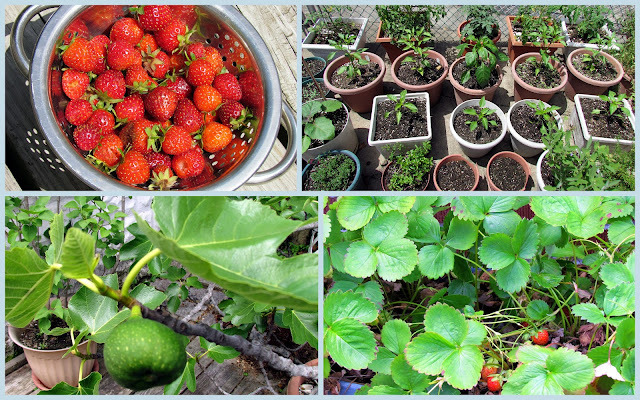 My New York City backyard is minuscule and composed of a wooden deck and cement, so the frustrated farmer in me has to be content to grow things in portable flower pots. I grow peppers, tomatoes, eggplants, herbs, and even raspberries and a fig tree in flower pots! My strawberry plants grow in rectangular flower boxes so they can spread out their runners as they like to do. The strawberries I harvest are small. but very tasty! To make the crust, in a food processor, combine the almonds and sugar and process until fairly finely ground. Add the flour and pulse to mix. Add the butter and pulse until the mixture resembles coarse meal. Add 2 Tbs. of the almond liqueur and pulse to bring the dough together in a rough mass, adding the remaining 1 Tbs. liqueur if the mixture is too dry. Transfer the mixture to a 9-inch tart pan with a removable bottom. Using your fingers, pat it evenly over the bottom and up the sides of the pan. Bake until light brown and set, about 25 minutes. Meanwhile, in a bowl, combine the almond paste and butter and beat with an electric mixer until smooth. Beat in the egg white. When the crust is ready, remove from the oven and let cool for about 5 minutes. Spread the almond paste mixture evenly over the bottom of the warm crust. Let cool completely, then arrange the berries or peaches decoratively over the top. Place the water in a small bowl, sprinkle the gelatin over the top, stir and let stand for several minutes to soften. In a small saucepan over low heat, warm the jelly until it melts, about 5 minutes. Stir in the dissolved gelatin until melted, about 30 seconds. Remove from the heat and let cool slightly. Brush the jelly glaze evenly over the fruit. Let cool completely and serve at room temperature. The almond crust was very light and had soft cookie consistency, and held its shape very well when cut. 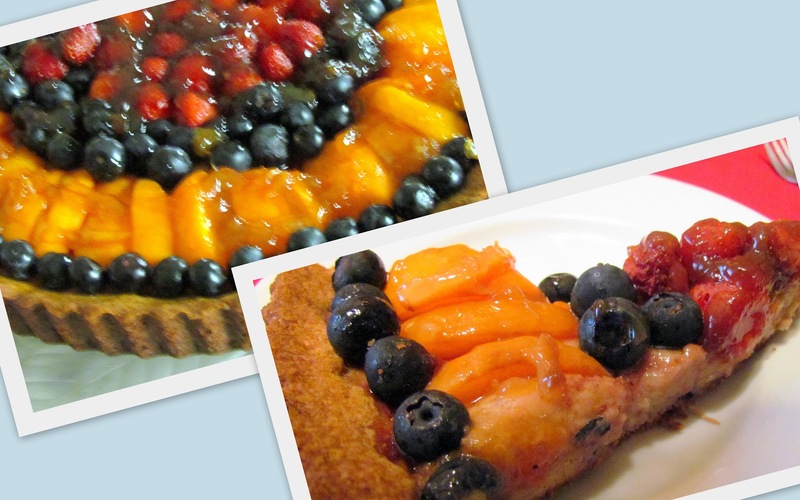 The almond paste filling held the fruit in place well and gave the tart a hint of almond flavor. The gelatin jam topping gave the fruit an extra sweetness and pretty glaze. All in all, it was a delicious tart, and one I'll be making often this summer with a variety of fresh fruits and berries. It is time for Vee's monthly note card party, where bloggers chose four photographs that they previously used in a blog post that they feel would be nice to turn into note cards. I decided to share some majestic animal portraits I made in Taronga Zoo, Mosman NSW, Australia in 2011. You can see that post and many more animal photos from that magnificent zoo on this link. Taronga Zoo is home to over 2,600 animals on 52 acres (21 hectares), making it one of the largest of its kind. The zoo places emphasis on the promotion of world wildlife conservation. Since 2008 the Taronga Foundation has spent over $200,000 helping protect endangered species in the wild, helping save and regenerate natural habitats and working with local communities to reduce conflict with wildlife. 2010 was earmarked as the International Year of Biodiversity where the Taronga Conservation Society supported nine projects focusing on education, anti-poaching, population management, wildlife health, and habitat restoration. These projects are taking place in Australia, India, Sri Lanka, Indonesia, Fiji, Nepal, Tanzania and Zambia and will help protect the habitat, health, and safety of a variety of animals. You can see a full list of all the animals living at the zoo at this link. I really enjoyed visiting this zoo and I think a wonderfully expressive animal face note card would be a fun card to receive. What do you think? You can check out Vee's and see links to all the other note card selections over at A Haven For Vee blog beginning at 8:30 PM EST Tuesday evening. Why not post your own card selections, link up, and join in all the fun? I miss my Daddy every day. He was such a good husband and father. An Army veteran of two wars, he was eleven years older than my Mother when they married, and they then went on to have four children. Quiet and dependable, I remember my Dad never missed a day of work. He loved to go fishing, watch baseball, and read. He often told me that when he was growing up he read every book in his little Pennsylvania town's public library. His favorite stories were James Fenimore Cooper's Leatherstocking Tales. When I was required to read The Last of the Mohicans in high school, we had our first of many "book talks." My Dad loved to laugh and watch comedies on tvs, such as Red Skelton, Phil Silvers, The Honeymooners, and Life with Riley. The Ed Sullivan Show and the Million Dollar Movie were hardly ever missed. My Dad smelled of the Old Spice cologne I bought him every Father's Day. He liked to jingle the coins in his pocket, and he often hummed happy old tunes such as Marzy Dotes. One of my fondest memories was the "Father/Daughter Dance" we attended at my all-girls high school when I was a senior student. He had to take the day off from work to attend the dance, and I know that was a sacrifice. He bought a corsage for me to wear and a boutonniere for himself for this special occasion -- you can see how we looked in the lower right of the photo collage above. It was such a proud and happy day for both of us! My family lost him tragically the next year. He went to work one day and never came home. How he died is much too sad and painful for me to detail here, but he died a hero trying to save others from his fate. I've missed him every day of the last forty years. This year my Mother joined him in heaven and we had the words "Together Again" inscribed on their gravestone. You were the best Father I could have wished for, Daddy! Happy Father's Day! Thankfully, I was also blessed with the kindest, most loving husband I could have ever dreamed about. 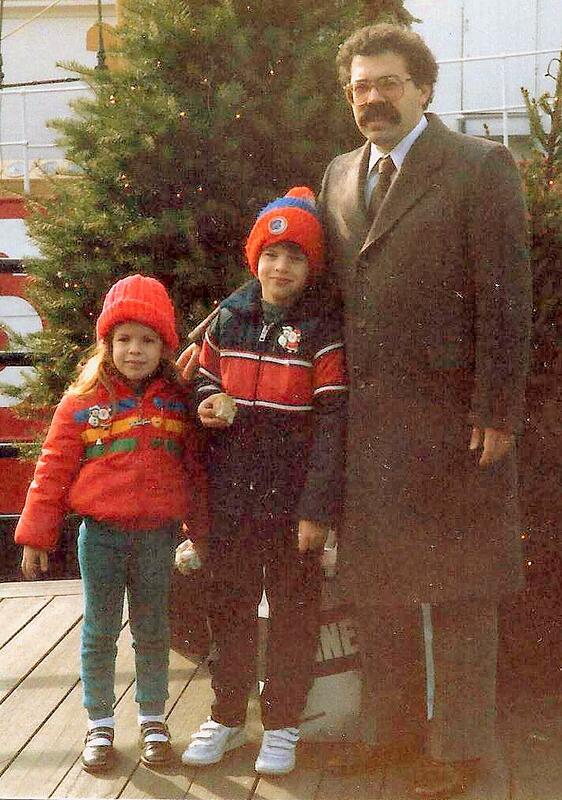 A man who was good a father to our children as my father was to me. A man who never raises his voice in anger, who is hard working and devoted to his family and who loves God and his adopted country. We will be married thirty-eight years this October, and each day has been better than the last. My only regret was that he and my father never met, but I know that they would have liked each other very much! Happy Father's Day, my dearest! 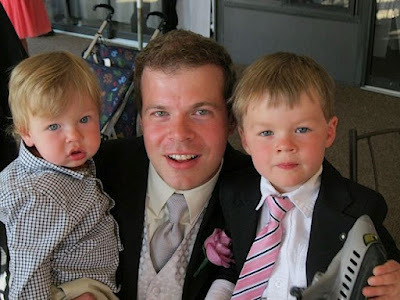 Now my husband and I have the added blessing of seeing our son be a kind and loving father to his own two sons. The shining examples of how his father raised him is evident in all he does. Our grandsons could not have been given a better father and we pray that they will one day be the same for their children. 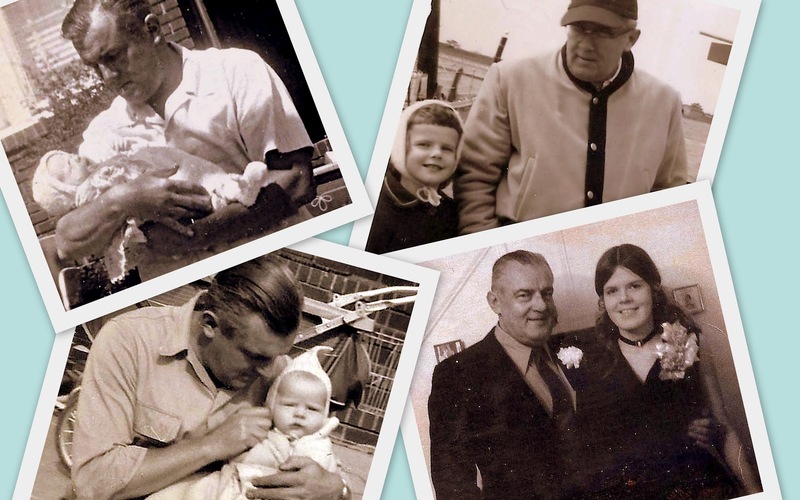 The legacy of loving fatherhood will hopefully be passed on for many generations to come. Happy Father's Day to our dear son! Happy Father's Day to all the good daddies everywhere! You matter more than you could ever imagine! Are you thinking about taking a vacation this year to a state where you can find a wonderful diversity of things to see and do? Where there are quaint towns, stone walls, historical sights, waterfalls, covered bridges, farm stands full of local produce, wineries, antiques, art galleries, designer outlets, world class casino resorts, fine dining and recreational opportunities, as well as scenery that will take your breath away? If so, consider visiting the beautiful state of Connecticut! Connecticut tourism, along with BlogHer, asked some bloggers to tell you why we love to visit Connecticut and is sponsoring a $1,000 gift card give away to one lucky commenter -- see the rules at the end of this post. My husband and I have been regular visitors to Connecticut since the first year of our marriage. Above are some vintage mid 70's photos of us on a trip to Connecticut's Mystic Seaport and the Museum of America and the Sea, the nation's leading maritime museum. It is a wonderful place for the entire family to visit, and we brought our children here often as they were growing up. In Mystic Seaport you can explore American maritime history first-hand as you climb aboard four National Historic Landmark tall ship vessels, stroll through a re-created 19th-century coastal village or visit the on site Henry B. duPont Preservation Shipyard, where you can observe as historic vessels are restored using traditional methods and tools. For young children's enjoyment there is a Children's Museum Discovery Barn and playscape area, while older children and adults would appreciate visiting Mystic Seaport's Treworgy Planetarium. Now that our children are grown and we have an empty nest, my husband and I love to take an occasional long weekend "get away" trip to stay in a romantic bed and breakfast located in one of the eight counties in Connecticut. We love to explore new towns and enjoy the wonderful hospitality we always find at each location. We also enjoy visiting the Foxwoods Resort and Casino on the Mashantucket Pequot Indian Reservation in Ledyard, to see big name entertainers perform. On other occasions we've attended a play at the top notch Westport Country Playhouse in Westport, or attended one of the many craft, art, food or music festivals that are held throughout Connecticut during the year. Litchfield County is one of our favorite Connecticut destinations because we enjoy all its natural attractions including the Housatonic River, Lake Waramaug, Lime Rock, the Appalachian Trail, and Mohawk Mountain for skiing. Autumn is my favorite season, and Connecticut can rival any other New England destination as far as having the most spectacular fall foliage! I took all the photos above on our last fall trip. Now is the time to make plans and reservations for a trip to Connecticut this autumn, where you can take a scenic drive along winding country roads and keep your camera busy taking photo after photo of the crimson, orange, and yellow trees. *As full disclosure, I am being compensated by Connecticut Tourism and BlogHer for this post, but my opinions and love for the state of Connecticut are all mine. Which Connecticut destination would you like to visit? Leave a comment below and you will be entered into a sweepstakes from BlogHer to win $1,000 to help you plan your trip! If you find you are having difficulty leaving a comment in the special BlogHer aggregate comment box below please go directly to the BlogherSweepstakes page on this link where you enter the $1,000 CT Tourism Sweepstakes there. Thank you and good luck! I've shown you my daughter and son-in-law's beautiful Brooklyn, New York, wedding ceremony on this post, my candid photos from their professional photo shoot in Brooklyn Bridge Park on this post, and their wedding cocktail hour and the following reception on this post. 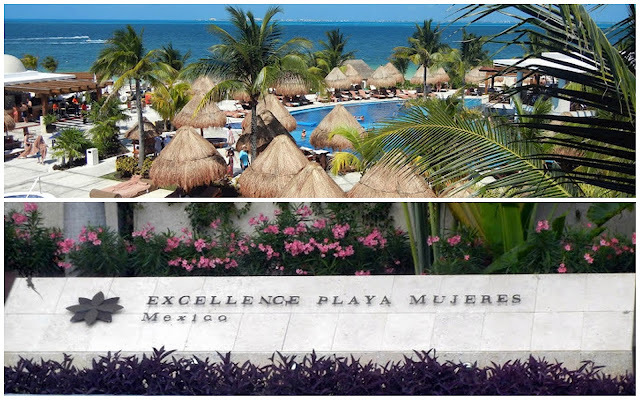 So to finish the joyful sequence to their marriage I thought I'd share a few photos of where they spent their honeymoon, in the Cancun area of Mexico the Excellence Resort Playa Mujeres. Many friends recommended this resort to Lisa and Joe, as they are noted for their top-notch service and accommodations. When they looked into the "all-inclusive honeymoon package" they were sold! 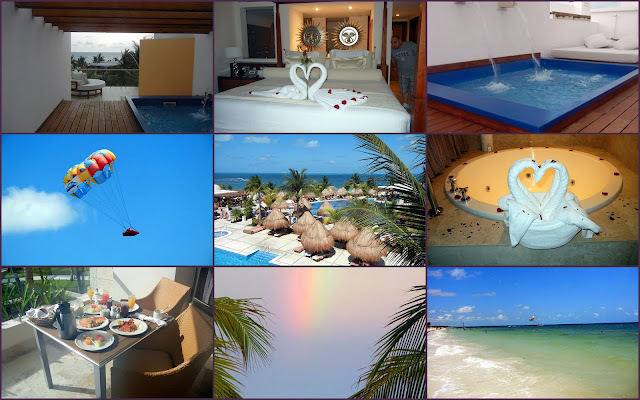 They had a gorgeous suite overlooking the Caribbean Sea, that also included its own private rooftop pool and jacuzzi. As part of their honeymoon package they were pampered with breakfast in bed (which they chose to eat at a table on their terrace), had couple massages, and were served a romantic dinner on the beach. They felt like they were in paradise! 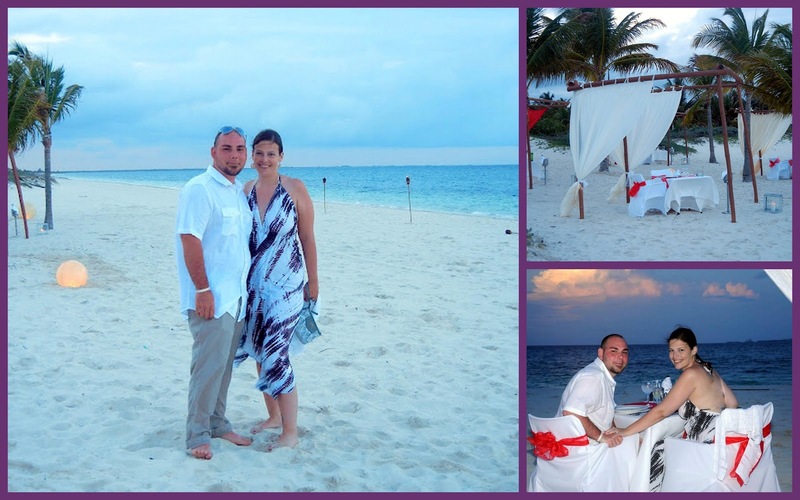 They went parasailing, snorkeling, rode jet skis and enjoyed the relaxing sun-filled days. On the last day there was an early morning rain shower and afterward, they saw a beautiful wide rainbow in the sky. It was a wonderful honeymoon, and a memorable way to begin their marriage. "And now abide faith, hope, and love, these three, but the greatest is love. ~ 1 Corinthians 13:13"
Thank you for your congratulations and best wishes to the new couple and for following along as I've shown you photos from their special days! The last few months have been a whirlwind of activity and planning and now I look forward towards enjoying summer and having "life back to normal." What are you looking forward to? Do you have any special summer plans?